The Basic School (TBS) is where all newly commissioned and appointed (for warrant officers) United States Marine Corps officers are taught the basics of being an "Officer of Marines". The Basic School is at Camp Barrett, Quantico, Virginia, in the south-west of the Marine Corps Base Quantico complex. Each year over 1,700 new officers are trained, representing such commissioning sources as the U.S. Naval Academy, Officer Candidates School, and Marine Corps Limited Duty Officer (LDO) and Warrant Officer accession programs. The School's "Five Horizontal Themes" define the expectations of every student officer at TBS. Has a clear understanding that a Marine commission brings with it "special trust and confidence" and the highest expectations of the American people. Gen. James F. Amos speaks to graduating Marines with Charlie Company, The Basic School (TBS), at Quantico, Va., 27 August 2014. The Assistant Commandant of the Marine Corps, Gen. John M. Paxton, Jr., speaks to students of Bravo Company at The Basic School in June 2014. After earning a commission, new Marine Second Lieutenants (Unrestricted Line Officer Marine lieutenants) complete the Officer Basic Course prior to beginning their job specialization (Military Occupational Speciality, or MOS) training to prepare them for service in the Marine Corps at large (Fleet Marine Force or other operating forces assignments). The majority of Marine Corps officers are commissioned through the USMC Officer Candidate School (OCS), but many are also graduates of the U.S. Naval Academy, or other service academies who choose to commission with the Marine Corps instead. Restricted Line/Limited Duty Officers are direct commissioned from the chief warrant officer ranks as either a first lieutenant or captain and do not attend BOC; however, as warrant officers they have already completed the WOBC at TBS prior to beginning their officer service in the operating forces. Most officers attend BOC as a second lieutenant immediately after commissioning at OCS or within a few months of graduation and commissioning from either the USNA or a NROTC program. Some newly commissioned officers may serve a short period of time in an interim assignment (such as an assistant athletic coach at the USNA) before beginning TBS/BOC. A few officers attend BOC as a first lieutenant because they were commissioned through the Platoon Leaders Class (PLC Law) program, which permits them to attend law school as second lieutenants and then attend TBS/BOC after promotion to first lieutenant upon receiving their law degree. In very rare cases, an officer who receives an initial commission in another branch of the US armed forces, and who has already been promoted to first lieutenant, may receive an interservice transfer to the Marine Corps and attend TBS as a first lieutenant. The Officer Basic Course currently lasts 28 weeks, during which new officers receive classroom, field, and practical application training on weapons, tactics, leadership and protocol. The course is split into three graded categories; Leadership, Academics, and Military Skills. Much like OCS, graded events are split between events that are graded, and events that must be passed. Events that must be passed are the 15 mile hike, all three exams, the Endurance Course, Final Land Navigation, Night Land Navigation, and Rifle and Pistol Qualification. Events that simply are given a grade are the 3, 6, 9, and 12 mile hikes, leadership billets in field exercises, and various decision making exercises. Classroom events include topic specific lectures, exams, tactical decision games (TDGs), sand table exercises (STEXs), decision-forcing cases, and small group discussions. There are various field events, beginning with fireteam and squad level, and progressing to platoon-reinforced and company-sized events. The field events consist of realistic blank-fire training and live fire ranges. Throughout the Program of Instruction (POI), Marines in each training company are split into 1/3's according to their combined scores of Leadership, Military Skills, and Academics. Each Marine ranks each specialization, or MOS, according to their preference, and each third is allocated an equal proportion of each specialization according to the Marine Corps' needs. Each third is independent of the others, so the top of the bottom third of placement is as likely to get the specialization that they want as the top of the other two thirds. Throughout the POI, each Marine will have the opportunity to select which specialization they prefer in a mock-draft like setting, selecting what they prefer from what what is leftover according to their grade placement in their third. Using these mock-drafts and listed preferences as reference, company staff then goes through each student and bestows upon them a specialization. This lottery system, however, does not apply to those Marines who signed air contracts to become pilots. Following the Basic Officer Course, the officer will attend one or more additional schools to be trained in their specialty, and then assigned to a unit in the Fleet Marine Force or other operating forces of the Marine Corps (e.g., Marine Barracks, Washington, DC, Marine Corps Chemical Biological Incident Response Force, Marine Corps Security Force Regiment, or the Marine Corps Embassy Security Group. Marine warrant officers attend a 16-week training regime similar in scope and instruction to the 28-week course required of second lieutenants, which is shortened due to the prior experience possessed by the newly appointed warrant officers. They are assigned to India Company at Camp Barrett. An enlisted Marine can apply for the warrant officer program after serving at least eight years of enlisted service, and reaching the grade of E-5 (Sergeant) for the administrative warrant officer program. For the Marine Warrant Officer (Gunner) program, a Marine must have at least sixteen years of enlisted service in an infantry MOS. This requirement is waived for those holding rank of (Gunnery Sergeant) for a minimum of one year prior to applying for the weapons warrant officer program. Sergeants or Staff NCOs who are selected are given additional leadership and management training during the Warrant Officer Basic Course. Graduates of the BOC who are selected for an infantry MOS remain at TBS for the twelve-week Infantry Officer Course. During this program lieutenants receive intensive classroom instruction, practical experience, and field training in crew-served weapons, patrolling, and reconnaissance to ensure that they are MOS qualified for all of the infantry platoon commander billets, in addition to the rifle platoon, within a Marine infantry battalion. The other infantry billets are: rifle company weapons platoon (i.e., crew-served weapons) commander, as well as commander of one of the three heavy-weapons platoons (viz., 81mm mortar, antiarmor, and heavy machine gun) of the infantry battalion weapons company. Infantry officers may seek to compete for a tour as a reconnaissance platoon commander after serving an initial tour with an infantry unit. Officers selected to serve in a Light Armored Reconnaissance (LAR) battalion complete an additional six-week LAR leaders course conducted at the School of Infantry. Marines who first arrive from OCS or the USNA, or who are unable to complete the BOC, WOBC, or IOC for either failing one of the three graded categories or are significantly injured are sent to M Company, or "Mike Company." Marines in Mike Company provide support operations for companies that are actively training, as well as attend classes and physical events, until they can be given a new MOS if they come from IOC, or resume training if they have yet to complete WOBC or BOC. Wikimedia Commons has media related to The Basic School. ^ "The Basic School". Headquarters Marine Corps. Retrieved 17 September 2007. 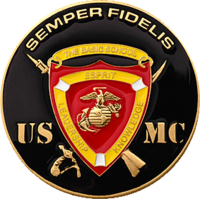 ^ "FISCAL YEAR 2018 (FY18) ENLISTED TO WARRANT OFFICER (WO) MARINE GUNNER SELECTION BOARD > The Official United States Marine Corps Public Website > Marines.mil - MARADMINS". www.marines.mil. Retrieved 2018-05-18. ^ General Emphasizes Leadership at Warrant Officer Commissioning 2nd Lt. Patrick Boyce, 8 February 2007. Retrieved 25 January 2011. "The Basic School", The Making of a Marine Officer, MarineTimes.com.